If you’ve experienced a radiating ache that begins in your lower back and runs down your legs, it’s most likely sciatica. Here’s how to use a foam roller to ease this frustrating nerve pain. The sciatic nerve begins in the lower back and runs all the way down both legs. When this lengthy nerve becomes compressed or pinched, searing pain, numbness, and tingling can occur. The cause of sciatic nerve compression can vary, but oftentimes it is due to a herniated disc, a narrowing of the spine, or tightness of the muscles that surround the nerve. (1) Sciatic pain often feels worse when sitting or standing still, and better once lying down or walking. 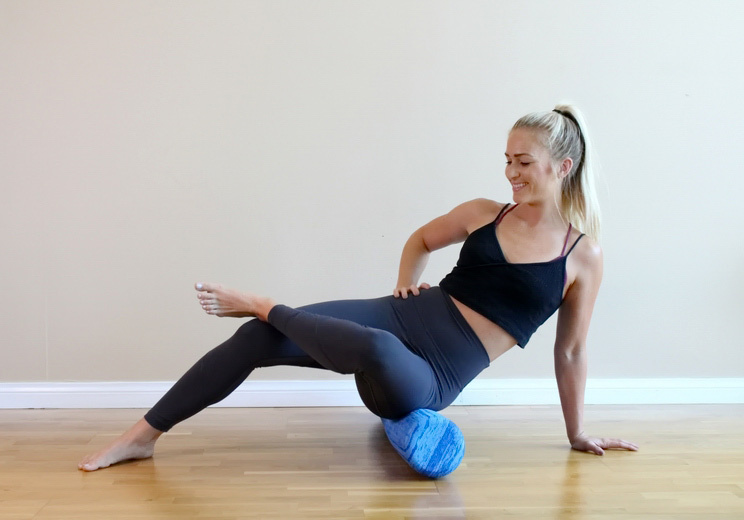 By releasing tight muscle fascia surrounding the sciatic nerve, foam rolling can alleviate tightness that is specifically causing sciatic pain. To begin foam rolling, we recommend getting a long, medium-softness foam roller. It is important to roll slowly around the areas of direct pain. When you find a tight, painful spot, stop and hold on the spot for 20-30 seconds to allow the fascia to release. Make sure to always listen to your body when foam rolling. The pain you experience should be comparable to the pain you’d experience when getting a deep tissue massage. If something doesn’t feel right, stop and check with your doctor. This routine can be practiced daily to relieve sciatic pain. The sciatic nerve runs below the piriformis muscle – a small triangular muscle of the hip. When this muscle becomes tight and inflamed, it can directly compress the sciatic nerve, leading to a type of sciatic pain known as Piriformis Syndrome. (3) This stretch helps to release tightness of the piriformis muscle, relieving compression on the sciatic nerve. Begin sitting on the foam roller with your feet on the floor. Place your hands down on the floor behind you to support your upper body. Cross your right ankle over your left thigh and flex the foot. 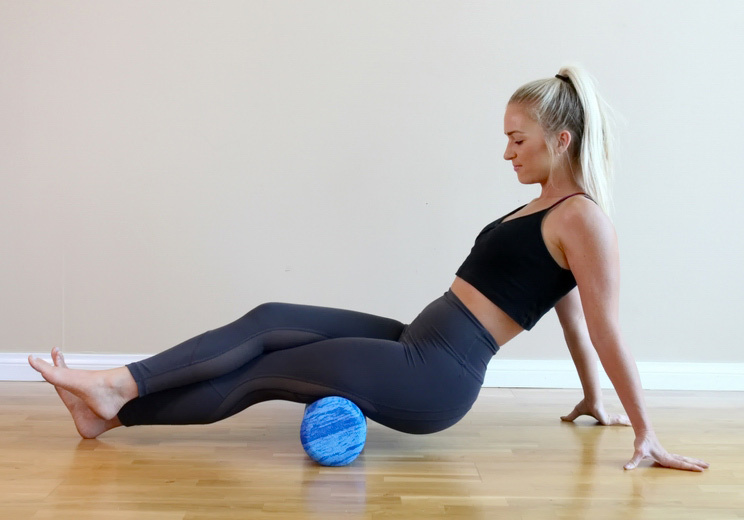 Slowly roll towards your right side so that the foam roller is pressing into your outer right hip. Take small rolls up and down and then small rocks forward and backward. When you feel a tight spot, stop and hold for 20-30 seconds, then continue rolling to identify more tense areas. After completing the right side, switch to the left side. This exercise further helps to relieve Piriformis Syndrome by releasing tightness in the hips and glutes. Begin in a high plank position with the foam roller lying horizontally underneath your torso. Pick your right leg up and bring your right shin forward, lining up your knee behind your right wrist. Adjust the foam roller so it runs underneath your hips. Your left leg should point straight back behind you. Place your hands on the foam roller and lift your chest. You should feel the foam roller pressing into your right glutes. Sitting and running can both put the hamstrings in a constant shortened position, causing them to be stiff and tight and sometimes leading to sciatic pain. This stretch uses the foam roller to massage out, lengthen, and relieve tightness in the hamstrings. Begin sitting on the floor with a foam roller in front of you. Put both hands on the ground behind you and lean back onto your palms. Place your right leg on top of the foam roller so that it rests right above your right knee. Cross your left ankle over your right to apply pressure onto your right hamstring. Press into your palms to lift your hips up off the ground and very slowly begin to roll towards your glutes. Stop when you find a tender spot and hold for 20-30 seconds, or until you feel a release. Continue rolling up until you reach right below the glutes, then slowly roll all the way back down to above the knee. Sciatic pain can lead to tightness and referred trigger points in the IT Band. Use this exercise to help loosen up the outer hips and thighs. Start by lying sideways on the foam roller so it rests right below your outer right hip. Straighten your right leg. Then, bend your left knee and step your left foot in front of your right thigh. Lean into your right palm so that your right arm and your left foot are controlling the amount of weight you are placing on the foam roller. Slowly roll up on the foam roller so that it rolls towards the knee. Stop and hold for 20-30 seconds whenever you find a knot, then continue on until you roll to right above the knee. Then, slowly reverse and roll back up towards the hip. Once you get back below the right hip, switch to the other leg. Any movement that causes you to hinge at your hips, such as sitting or running, can quickly lead to tight hip flexors. 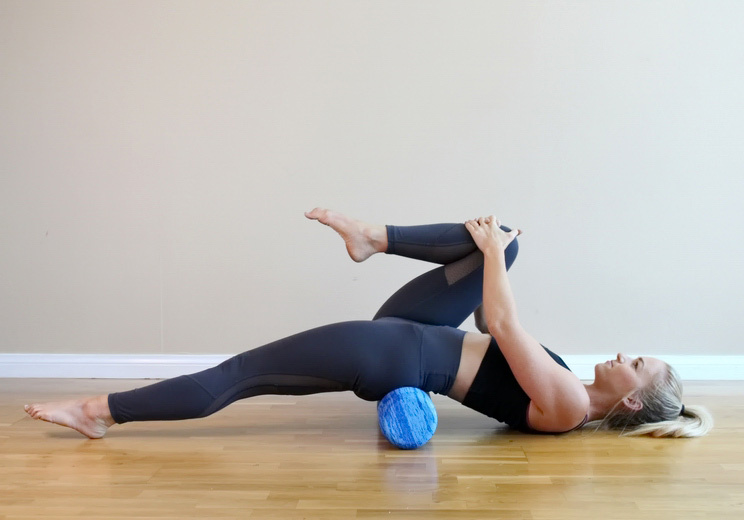 This stretch uses the foam roller to massage out tension in the psoas muscle. Start by lying face down on your foam roller so that it rests underneath and a little below your right hip. Bring your left leg out to the side at a 90-degree angle and place your forearms on the ground in front of you to support some of your weight. Straighten your right leg back behind you with your toes untucked and begin to take small back-and-forth and side-to-side movements. When you find a tight spot, stop and hold for 20-30 seconds. This is another great foam rolling stretch for opening the hip flexors, creating balance in the hips. Straighten your right arm out to the right side with your palm facing down. Place your left hand on the outside of your right knee. On an exhale, use your left hand to draw your right knee across your body into a twist. Hold for 30 seconds, then come back to center. Repeat on the other side.